Welcome in this free guide ! 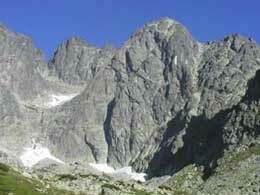 The guide is a nocommercial project, which maps mountaineer's routes in Slovak part of the High Tatras National Park. The High Tatras is Central Europe's mountain paradise, which is region of most beautiful Slovak mountains. The Tatras offer a superb compact mountain landscape which varies from open meadows and pine forests to broad glacial valleys with spectacularly tarns surrounded by jagged alpine peaks. Tatras provides facilities which more than compare with many other famous international resorts. Although not as high or domineering as the Alps, this beautiful mountainous region offers a similar broad range of activities such as hiking, climbing and skiing.You can find similar tatras projects in the other web pages - look at links on the top of this page (slovak text). The guide has been developing regularly and you can find new information about peaks and routes every month. English description of the peaks, valleys, and descent info will be available as soon as possible. Important references: look at the numbered references in the text box. Na tomto mieste si dovoľujem poďakovať velikánom tatranskej sprievodcovskej literatúry: A. Puškášovi, W.H. Paryskému, J. Andrášimu, Pánom horolezcom : I. Gálfymu, V. Tatarkovi, L. Janigovi a ďalším za monografie stien, I. Dieškovi, I. Kollerovi a P. Kostovskému - neúnavnym zberateľom nákresov a za ich publikovanie. V neposlednom rade - J. Gurníkovi, V. Jakubcovi, A. Paszczakovi a mnohým ďalším za ich cenné rady a pripomienky. Bez ich podkladov a pomoci by tento projekt nikdy nevznikol. Prajeme Vám príjemné chvíle strávené s našou stránkou. Informácie: text, grafické podklady ako schémy, fotografie atď., nie sú priamo v stránke citované. Sú spracované s použím nasledovnej literatúry, v ktorej sú uvedené aj ďalšie citácie. 14.GL - R. Gálfy - A. Luczy Vysoké Tatry Horolezecký sprievodca Výber ciest I.
Horolezectvo je potenciálne nebezpečný šport, údaje uvedené v tomto sprievodcovi sú len informatívne a autori nenesú zodpovednosť za prípadné zdravotné následky alebo smrť pri výstupoch vykonávaných na základe uverejnených údajov. Mountaineering and climbing are potencially dangerous activities. Information and data from this web guide site are only informative. Users can use this information only in their own risk and responsibility. You personally assume all risks and resposibilities or all damage, injury or death, which may occur if using incorrect data of this site (www.tatry.nfo.sk) in any manner.